inFlow is a desktop-based inventory management software that helps small and medium-sized businesses in tracking inventory. Its other features include filling customer orders, reordering stock, generating purchase orders and invoices, and creating customized reports. The software comes with the standard installation package for desktop computers, however, it is not available for the cloud. 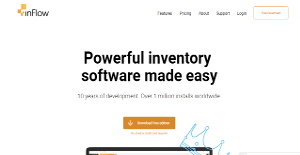 inFlow is quite a popular choice among the many inventory management software available for desktop users. According to the company itself, in Flow is the most downloaded inventory management software, a claim that is yet to be proved. inFlow is designed to work in a wide range of businesses and industries, like wholesalers, retailers, manufacturers, healthcare, e-commerce, and government. The software offers pretty much most of the necessary inventory management functionalities. InFlow is based on Microsoft SQL Server which takes it a number of steps more than installing a typical package software. It does provide a great deal of knowledgebase and FAQs to carry out the installation process. Despite being an old software with an orthodox approach, it comes as a pleasing interface that looks similar to the one provided in Windows XP and later in Windows 7. This makes it easier for Windows users to operate the software quite easily. The Sales, Purchasing, Inventory, and Reports, as well as General and Settings functions, can be accessed using a Windows Start-like button. On the main page, a list of most common tasks has been provided. Captures of shortcuts to features like Dashboard, Reports, and Settings are also provided on the main page. inFlow dashboard shows a timeline graph that you can be easily modified using a drop-down menu. These data sets are customizable and defaults can be edited to get desired sets. By default, Sales completed, the cost of goods sold, and sales profit are shown. Other features that can be added include sales orders, purchase orders, cash in and cash out, net cash flow, customer and vendor payments due, and cost value of inventory. The reporting tools are quite powerful as well. You can build reports depending on your requirements. The display options include line graph, bar graph, and pie chart. The number of outstanding sales orders, purchase orders, products to reorder can also be shown on the dashboard. Multi-tasking is also possible which makes it a lot easier to move between different tasks while keeping one pending. Thanks to multiple tab option, you can open as many tabs as you like to carry out the operations smoothly. Setting up an account is quite simple. All you need to enter basic data like company info, taxes, pricing, products and you are good to go. Since each company has specific business needs, it is advisable for them to desist from looking for a one-size-fits-all faultless software system. Needless to say, it would be futile to try to find such a system even among widely used software applications. The clever thing to do would be to catalog the various important elements that need consideration such as key features, budget, skill levels of employees, company size etc. Then, you should do your research thoroughly. Read some inFlow Inventory reviews and check out each of the other solutions in your shortlist in detail. Such in-depth research can ensure you discard ill-fitting platforms and select the system that offers all the elements you need for business success. How Much Does inFlow Inventory Cost? We realize that when you make a decision to buy Inventory Management Software it’s important not only to see how experts evaluate it in their reviews, but also to find out if the real people and companies that buy it are actually satisfied with the product. That’s why we’ve created our behavior-based Customer Satisfaction Algorithm™ that gathers customer reviews, comments and inFlow Inventory reviews across a wide range of social media sites. The data is then presented in an easy to digest form showing how many people had positive and negative experience with inFlow Inventory. With that information at hand you should be equipped to make an informed buying decision that you won’t regret. What are inFlow Inventory pricing details? What integrations are available for inFlow Inventory? If you need more information about inFlow Inventory or you simply have a question let us know what you need and we’ll forward your request directly to the vendor.